The Nulhegan Abenaki Drum has a unique sound. They combine Traditional Northeastern music with the sound of the big Powwow style drum. When they perform you hear the heart beat of Mother Earth. They have performed alt events al over the State of Vermont. 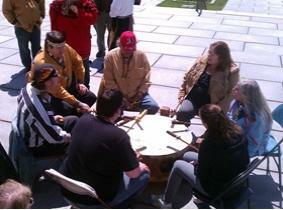 The Nulhegan Band of the Coosuk-Abenaki People Tribal Drummers and Singers perform the 'Warrior's Song' on Recognition Day, April 22nd, 2011. On this day, Governor Peter Shumlin of Vermont granted state recognition to two Abenaki bands; the El-Nu Abenaki Tribe and The Nulhegan Band of the Coosuk-Abenaki People. Following the signing of the two bills granting recognition, the two bands gathered outside of the State House for traditional singing to celebrate and honor those who passed on to the next world before recognition was granted.